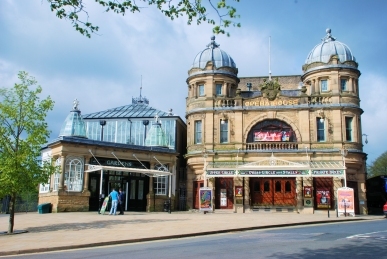 We are conveniently located (centrally) in ‘Higher Buxton’, near to many places of interest. The fabulous Opera House is five minutes walk away, as is the main shopping street. Buxton is surrounded by the beautiful Peak District, which boasts many spectacular locations within a 20 minute drive. Chatsworth House, Haddon Hall, Eyam Hall, Lyme Park are all amazing stately homes in the area. Villages and towns nearby include Bakewell, Castleton, Eyam, Glossop, Hartington, Macclesfield and Dove Holes. We are located 45 minutes from Manchester Airport, the M1 & M6. 60 minutes from East Midlands Airport & Donnington Park, and only 30 minutes from Alton Towers. We’re only a 10 minute walk from Buxton Train Station which offers a direct service to Manchester Piccadilly hourly. All buses to and from Buxton, stop on the Market Place (just 1 minute from our door). Buxton also has many local activities both in and around the town, why not try hanging around in the trees at Go Ape, cycling the magnificent Monsal Trail where local bike hire can be arranged or we can offer storage of your own bikes or just taking a leisurely stroll through Poole’s Cavern. The Olympic Torch passed directly in front of the Queen’s Head Hotel on June 29th 2012.